La Casa Resort is the perfect place for the family with children. 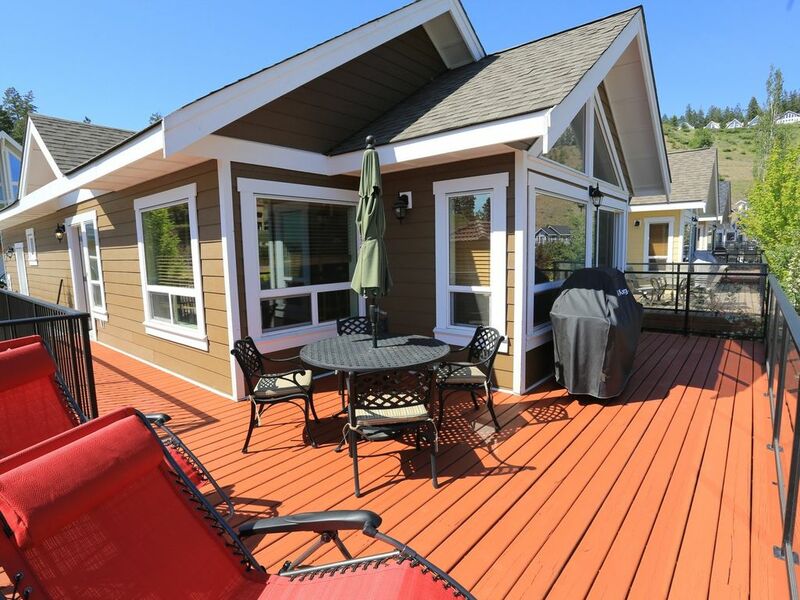 Relax on the sundeck while the children play on the playground or shoot some mini golf all within your view. The pool and tennis courts are another 50ft. beyond and also within view. The corner store and restaurant is across from the pool area. This cottage is also great for people that don't want a lot of stairs as the main living area, kitchen, dining room, sundeck, bathroom with tub and shower and master bedroom are all on the main floor. 2 more bedrooms and another bath with tub and shower are on the downstairs level. The owner assured us pool and hot tub were available to the end of October. He lied. When we wanted to play mini golf and looked for clubs the caretaker said they are over there in the bin. The clubs were far away from where he indicated and locked up. When we went back the caretaken had quite the smirk...The store was not open with on the posted hours. I take great offense to someone publicly calling me a liar when it's COMPLETELY false and unsubstantiated. So much so, I wrote to Betty and asked her to explain herself before I replied online. I asked where/when I had told her things because I certainly had no record of it. Of course, she did not even have the courtesy to reply to explain herself. The pool areas are typically shutdown in October after the Thanksgiving day weekend ( Betty came the week after ) and if anyone asks a question I do not know the answer to - I always do the research BEFORE I reply. I also specifically sent her a letter BEFORE her arrival about the golf clubs and balls and that if it was pertinent to her she should bring some because mine seem to "disappear" every year. I don;t believe she even read it as she caleld for instructions on how to find the place which again maps and addresses were given to her. In short, Betty was given ALL the information she needed ahead of time, did not call to ask about anything, and brought THREE dogs which the cleaners were none too happy about. It's a shame when people pay so little attention to detail that they don't know whether they're coming or going. In summary, I am always online and availabale for any and all questions. If I don't know the answer - I will find out for you. When you're at the cottage and you cannot find/locate something - again - please just call. We can always get it rectified quickly as there are staff on site to assist. This is our 3 time at this cabin. We love the location. It’s perfect with with kids. The house itself was nice enough..though it started feeling small throughout the week with 4 kids and 4 adults. We were going to bring my sisters dog but didnt in the end, luckily as theres no gate or yard outside. The kids liked the pool but the beach was an unwalkable distance with the kids and a steep walk even after the drive to the parking lot. Very rocky and no sand at the water so we ended up driving about an hr to the proper beach but pretty dissapointing looking at that lake every day and having it so hard to access. The estate is so far from anything. Closest mini mall is about half hr drive on very windy mountain road with limited shops and actual grocery stores over an hr. The shop at La Casa was very limited and ran out of things quickly and often, coffee shop was terrible and restaurant ok but very basic. This place has tons of units and is expensive enough..its unfortunate they dont stock the shop with more variety..some fresh okanagan fruit for example. They could charge a fortune and still sell out because theres no competition. Also they really need a proper espresso machine, the coffees and fraps etc were terrible and still expensive! It wasnt terrible, wasnt great. Wouldnt stay here again. Thanks for the feedback. The store is privately run so not much I can do about that... it's just a small resort. Yes - the lake has rocks as most lakes do - you need to bring some water shoes but the water is crystal clear and beautiful. You sound like a glass half full kind of person as everyone else had a GREAT time over the summer. The maids did apologize which was a mistake they made as you had an abnormal turnover day. Just not your style I get it! We had a wonderful stay. David's prompt and timely communications enhanced our stay. Thank you! The place is wonderful. The house was comfortable. For sure, l will come to stay on this place again. Summer Peak Season rentals are in blocks of 1 week - Saturday thru Saturday ONLY due to overwhelming demand.